One of the great wonders of the world to me is how anyone could claim to be a Catholic and still believe the Bible is God's Word. Even the Catholic Douay version of the Bible condemns the Catholic faith repeatedly. 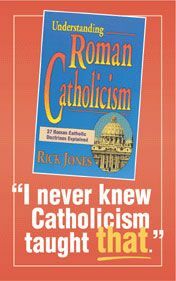 The honest truth is that Catholics have been brainwashed to accept the traditional teachings of the Vatican as superior to whatever the Word of God actually says. Jesus plainly condemned placing the traditions of religion over the Word of God (Mark 7:6-13). Psalm 118:8 admonishes, "It is better to trust in the LORD than to put confidence in man." I'll give you several examples of how the Catholic religion contradicts the Bible, placing man's tradition over God's Word. Bowing to Mary is Idolatry! There is absolutely NOTHING in the Bible leading Christians to recognize Mary, adore Mary, or talk to Mary. 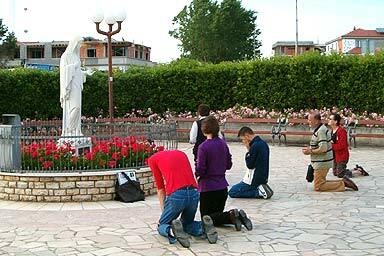 Although most Catholics deny worshipping Mary, a picture is worth 1,000 words. The picture of Pope John Paul II adoring Our Lady of Fatima to the right, and the photo of Catholics bowing to Mary at the left, are clear irrefutable evidences of idolatry. Look up the word "worship" in any dictionary and you'll find that Catholics do indeed WORSHIP Mary and other hordes of dead saints. 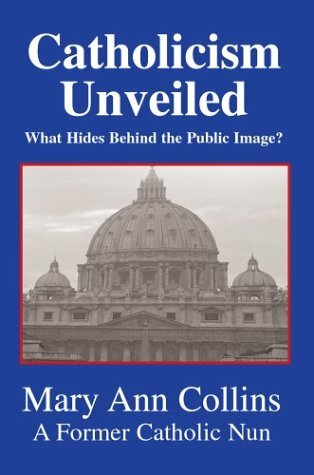 Those who want to fellowship with the Roman Catholic Church and accept it as a true "church" are ignoring its blasphemous teachings concerning Mary. The Catholic religion is straight out of the pits of Hell! The Vatican II Council and the New Catholic Catechism reaffirmed that Mary is the sinless Mother of God, that she ascended bodily to Glory (i.e., the Assumption of Mary) and was crowned as the Queen of Heaven, that she can hear and answer prayer. Of course, no such teachings are found ANYWHERE in the Bible. Mary is NOT the queen of heaven, she did NOT ascend bodily, and Mary certainly is NOT sinless! The mother of Jesus was a sinner! Where in the world did anyone ever get the twisted idea that Mary was sinless? No such teaching is taught in the Word of God. The Bible is clear in Romans 3:23 ... "For all have sinned, and come short of the glory of God." That includes Mary! The ONLY sinless being who ever walked this earth was the Lord and Savior, Jesus Christ (2nd Corinthians 5:21; Hebrews 4:15). Again, there is NOTHING taught in the Bible about praying a Rosary, counting beads, etc. In fact, Jesus condemned vain repetitions, "But when ye pray, use not vain repetitions, as the heathen do: for they think that they shall be heard for their much speaking" (Matthew 6:7). So why do Catholics disobey God? The Catholic Rosary is largely a prayer to Mary. The Rosary is blasphemy! Though Catholics like to point out that they are not praying to Mary, the 2nd of the ten commandments clearly prohibits and warns us NOT to BOW DOWN to any graven image. God in the 2nd commandment even goes as far as to warn us against bowing down to the likeness of anything in HEAVEN OR EARTH. Mary worship is a sin! Pope John Paul II is a great Mary lover. In his book Crossing the Threshold of Hope, the Pope testifies that his personal devotion to Mary was developed at Marian sites such as Jasna Gora (home of the Black Madonna) in his homeland of Poland (Crossing the Threshold of Hope, p. 220). The Pope has "Totus Tuus" (All Yours) embroidered on his papal garments, designating his "abandonment to Mary" (Crossing the Threshold of Hope, p. 215). After the Pope was shot during an assassination attempt in May 1981, he attributed his subsequent recovery to Mary, and it was at shrines such as Jasna Gora and Fatima that he has expressed his thankfulness to the "Queen of Heaven." He prays to Mary daily. This is an abomination unto the Lord. "Now the Spirit speaketh expressly, that in the latter times some shall depart from the faith, giving heed to seducing spirits, and doctrines of devils; Speaking lies in hypocrisy; having their conscience seared with a hot iron; Forbidding to marry, and commanding to abstain from meats..." (1st Timothy 4:1-3). It's not difficult at all to EXPOSE the demonic Catholic faith if a person is simply willing to believe the Bible over Catholic tradition--but that's the BIG PROBLEM ... Jesus said in Matthew 15:9, "But in vain they do worship me, teaching for doctrines the commandments of men." The Bible teaches that Peter had a wife (Matthew 8:14). Yet, Catholic priests are wrongfully denied the God-given privilege to marry. The results have been tragic. It's almost impossible to convince a Catholic that all of their priests, archbishops, cardinals, and even the Popes are heretics. I can tell you with great certain my friend--they are all LIARS! How can I be so bold as to say such a thing? It's simply because I have in my hand the eternal, inspired, inerrant, infallible, preserved, Words of God. Most Catholics DON'T genuinely believe the Bible. Rather, they have sold their souls to a bunch of religious charlatans (priests) who commit blasphemy by claiming to have the power to forgive your sins. Please read, Who Can Forgive Sin? by my friend, Pastor Max D. Younce. Even the self-righteous hypocritical Pharisees knew better than to be so arrogant as to claim the power to forgive someone's sin ... "And the scribes and the Pharisees began to reason, saying ... Who can forgive sins, but God alone?" Woe unto the Catholic Church, for it is a prisonhouse of religion. Romans 10:3,4 proclaims, "For they being ignorant of God's righteousness, and going about to establish their own righteousness, have not submitted themselves unto the righteousness of God. For Christ is the end of the law for righteousness to every one that believeth." Call No Man "Father" or "Master" - Priests Cannot Forgive Sin! Even the Catholic Bible states in Matthew 23:8-11, "But be not ye called Rabbi: for one is your Master, even Christ; and all ye are brethren. And call no man your father upon the earth: for one is your Father, which is in heaven. Neither be ye called masters: for one is your Master, even Christ. But he that is greatest among you shall be your servant." Simply stated, the Bible condemns allowing ministers to come between us and God. We read in 1st Timothy 2:5, "For there is one God, and one mediator between God and men, the man Christ Jesus." 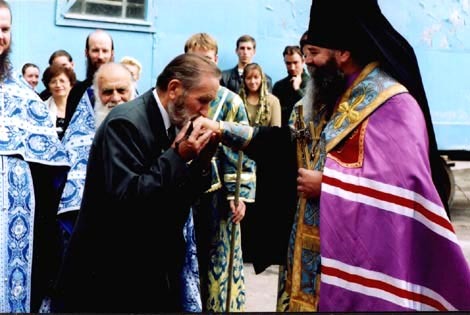 Jesus condemned recognizing any man as the "vicar" of God, or as a having special privileges or powers from God. Catholics are taught to believe that the Pope is literally God's messenger upon the earth. When El Papa speaks, Catholics worldwide hinge on every word, as if God Himself were speaking. The above picture speaks volumes against Catholicism. It should be obvious to the spiritually-minded believer that Satan is conditioning the masses to receive the Antichrist when he comes. It is sinful to recognize any man, priest, or minister, as a spiritual AUTHORITY over you. This is what Jesus meant when He prohibited calling ministers or priests, "Father" or "Rabbi" or "Master." We are not to give them that right. God's Word is the FINAL AUTHORITY! Not the Jewish Kabbalah. Not the Qur'an. Not the Jewish Rabbi. Not the Pope. Not the priest. Not the minister. Not the Church. Most Catholics have totally submitted themselves to their local priest. This is why so much sexual-molesting of children has transpired over the decades within the Catholic Church--because people SUBMIT to ungodly authorities which the Bible says not to. We should only submit to God, and His Word. Preachers and ministers ONLY have the power of INFLUENCE; but, the Word of God is to be our measuring stick by which we size them up. If they fail to present the Word of God faithfully, then we are to forsake them, as we should all false prophets! We must NEVER allow men to lead us away from God. It is so strange how the Word of God condemns the Catholic religion in plain Words; yet, Catholics BLINDLY follow the Pope and priests. It says in Matthew 23:9, in black and white, even in the Catholic Douay Bible, not to call any man "Father." Yet, that is exactly what Catholics call their priests, cardinals, and Bishops. Exodus 20:4,5 couldn't be any clearer that even BOWING down to a statue is idolatry. 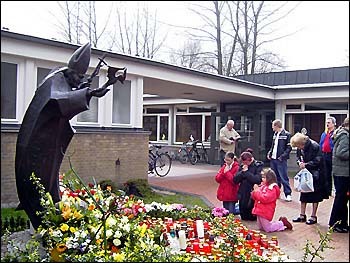 Yet, Catholics foolishly claim that they are not worshipping the statues they are bowing down to. BUT, God forbids us from even bowing to statues. In fact, the Bible is so clear on this matter that the Vatican has even REMOVED the second of the Ten Commandments to deceive you. No wonder 1st Timothy 4:2 states, "Speaking lies in hypocrisy; having their conscience seared with a hot iron." 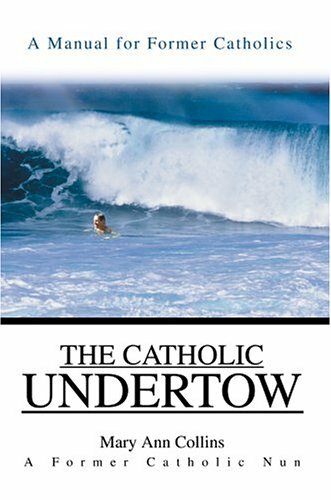 Everything that the Catholic Church has taught you is twisted, corrupted, and damnable!!! And their conscience's are calloused, harder than steel. In the old days, a wounded soldier would sterilize and seal his would by placing a red-hot sword over the affected area. Ouch! As you can imagine, placing a red-hot sword over any area of your body is going to kill all sensation to that area for a very long time. The Bible teaches that false prophets have their hearts seared, as with a hot iron. In other words, the same sun that melt the wax, hardens the clay. The Bible directs us to "Refuse profane and old wives' fables..." Every Catholic needs to REFUSE to believe the lies of Catholicism any longer, and turn instead to the precious Word of God. There is NOTHING in the Bible about praying to statues. There is NOTHING in the Bible about not eating meat on Fridays. There is NOTHING in the Bible about worshipping the dead. There is NOTHING in the Bible about digesting Jesus' flesh and blood. The Catholic religion can't make up it's mind and keeps changing it's dogma (doctrine). In fact, here's a long list of Catholicism's manmade heresies and when they were fabricated. Catholics just keep making it up as they go. Peter's Tomb Recently Discovered in Jerusalem--NOT Rome!